queXS 1.13.1 has been released on Sourceforge today. This release fixes a few issues that arose from the large administrative backend changes in the 1.13.0 release. A new feature of being able to generate cases on sample import has been implemented. This allows for a seamless web invitation first then telephone follow up methodology. queXS 1.13.0 has been released on Sourceforge today. This is a major update to the administrative interface as well as the sample management backend database. This fantastic work has been done by Alex (https://launchpad.net/~ddrmoscow). Thank you very much for your contributions to queXS as well as the complete translation to Russian. Bugs relating to case selection and quota sorting have been resolved. queXS 1.12.0 has been released on Sourceforge today. Complex quotas have been implemented. These quotas allow for multiple sample fields to be referenced when calculating completions instead of a single field. Also, time slots can be defined on a sample by sample basis as well as a questionnaire by questionnaire basis. Also included is a collection of bug fixes and translation/localisation updates. Some bugs with system sort related to quotas have been fixed, along with some translation and language related bugs. Anyone who uses quotas is advised to upgrade. queXS now supports time slots for cases. This allows for time slots to be defined, and the call scheduler will make sure cases are assigned to be called equally over all timeslots. 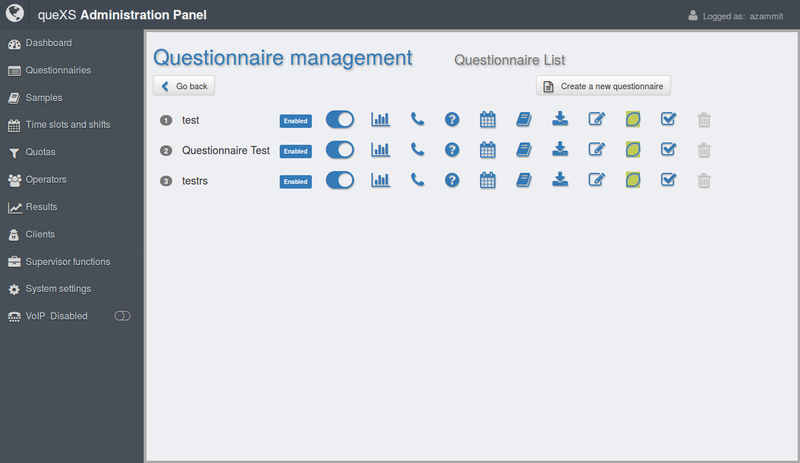 System sorting has been improved to work on a questionnaire by questionnaire basis which reduces down time for interviewers while the system sorts. The default timezone is now defined in the administrative menu instead of from the configuration file. Bugs with row quotas being incremented in samples that have not been accessed, and the system sort process not correctly closing when stopped in some cases have been resolved. Translations have also been updated. Thank you for your contributions! Bug fixes for the initial interviewer page, which was not changing based on the call/case state. Also, the case outcome was not being correctly set in some cases. An almost complete Simplified Chinese translation has been added - Thank you! Bug fixes for the interface when displayed in a language other than English, and also when using customised respondent selection module. New features including the ability to remove all identifying information from a case, and to include shift report notes in data output. Translations have been updated. Thank you especially to Daniel for beginning a German translation.